LAC-MEGANTIC, Quebec - Representatives of local municipalities and organizations described the visit to Farmington, Maine's sister city as "humbling" and "fruitful" today, after meeting with the mayor and other Lac-Mégantic officials. Farmington Selectman Ryan Morgan, Wilton Selectman and Sen. Tom Saviello (R - Wilton), Scott Landry, president of the Franklin County Chamber of Commerce, Steve Philbrick, president of the Rangeley Lakes Chamber of Commerce and Daniel Deveau, with the office of Gov. Paul LePage, visited the town Wednesday afternoon to determine what their specific needs were. The town of approximately 6,000 is located 20 miles north of the Maine border at Coburn Gore. A portion of the Lac-Mégantic downtown was destroyed in the early morning hours of July 6, after a 73-car train carrying an estimated 2 million gallons of crude oil derailed in the center of town. The derailment caused multiple fiery explosions, widespread damage and a number of fatalities. According to Canadian news reports, 38 bodies have been recovered by rescue workers, 17 of which have been identified. Another 12 people are missing and presumed dead. The visiting officials did not go into the devastated area, but toured the local high school which has been become the command center for the Red Cross' recovery effort. 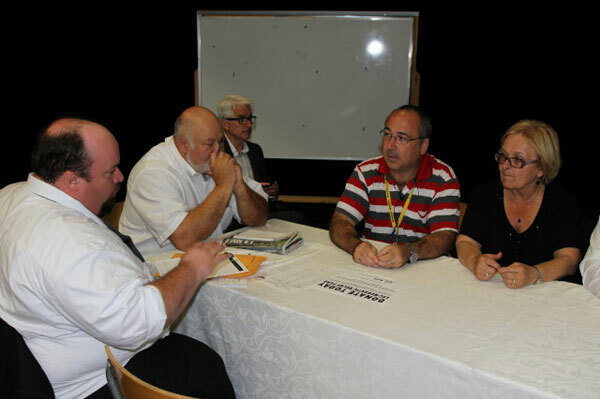 They were also interviewed by roughly 50 members of Canadian media following their meeting with local officials. Morgan said he was "amazed" by the scope of the operation, which consisted of as many as 80 Red Cross personnel working to meet the needs of people that remained displaced by the damage. "It was a well-oiled machine," Morgan said. 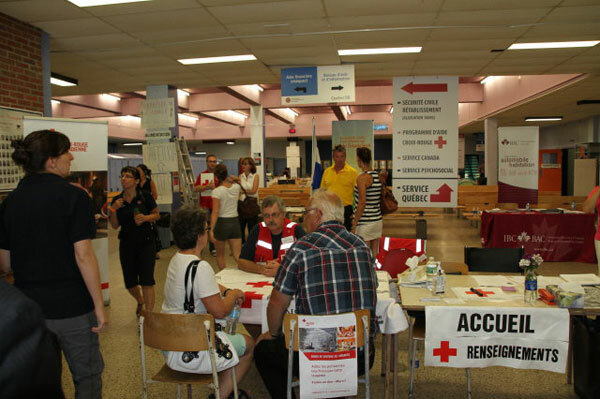 Lac-Mégantic citizens could meet with insurance experts, aid workers and receive supplies in the same building, he said. Morgan was particularly impressed with Mayor Colette Roy-Laroche, whom he described as the "epicenter" of the recovery effort. The delegation brought copies of letters and emails they'd received regarding Lac-Mégantic, as well as Farmington Fire Rescue and other local department patches and pins. Morgan said he would "never forget" how Roy-Laroche had picked up one pin and kept it in her hand throughout the entire meeting. Thirty-fire fighters from the towns of Farmington, Eustis, Rangeley, Phillips, Strong, New Vineyard and Chesterville brought trucks and equipment north after a request came from Canada in the early-morning hours of July 6, returning home the next day. The visiting delegation met with Roy-Laroche and other local officials to determine what the needs of the town were. Both Morgan and Landry indicated Wednesday that the town's need was at this point entirely financial: there were already significant supplies of clothing, furniture and other large items, and the town had no place to put donated material. Lac-Mégantic needs money, in the short-term to cover the needs of displaced individuals without insurance, such as renters, and in the long-term to ensure the continual survival of the town. With the railway destroyed, a significant portion of the town's economy had ground to a standstill, including a nearby industrial sector that employed roughly 20 percent of Lac-Mégantic's citizens, according to Landry. Officials at Lac-Mégantic are hoping the rail line will be rebuilt, going through that industrial park rather than the downtown, but meanwhile the government there is hoping that the tourism trade can bolster the town. Morgan said that the town generally welcomes approximately 120,000 tourists a year, and officials there were now concerned that small, "mom and pop" stores would go under without that tourist trade. "There's a gorgeous golf course, a beautiful lake and a lot to do," Morgan said, asking that people consider visiting the town and "spend some money and time." "One of the best things would be if the people that normally go up to Lac-Mégantic keep going," Landry agreed. "It is such a beautiful city, we all should really go up there more." The Lac-Mégantic Relief Fund, an account at TD Bank created by Farmington Selectmen. People can drop off or send in donations to the bank, located at 163 Broadway, and indicate that the funds should be deposited in the relief account. Morgan said that roughly $6,000 was now in the account. A futures account has also been established by the Chamber of Commerce in that area. Selectman Ryan Morgan, right, receives the thanks of a resident for Franklin County's concern and the dispatch of 35 firefighters on the morning of the disaster. 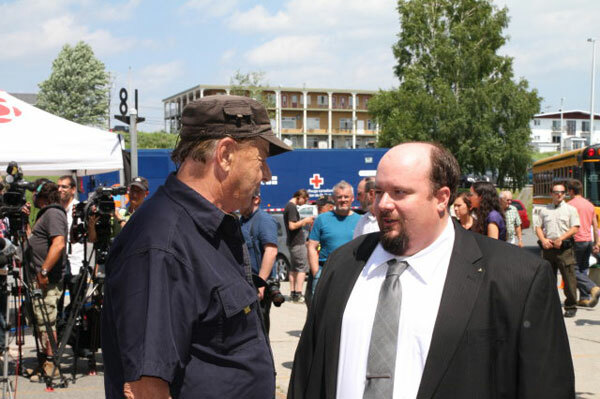 Thank you so much to be involved with the people of Lac-Mégantic. My family who live in the Province of Québec near Mégantic were very impressed by your efforts to connect and help.